Two joint ventures have been formed to construct about 2,200 apartments in Toronto — 30 per cent of them designated as affordable housing — the developers announced on Friday. The projects also incorporate retail and possibly office space. In the largest of the two projects, Dream Unlimited Corp. (DRM-T), Dream Hard Asset Alternatives Trust (DRA-UN-T), Kilmer, and Tricon Capital Group Inc. (TCN-T) will develop and manage a rental apartment community of about 1,500 units in Toronto’s West Don Lands. The partnership was selected through a marketed offering to sign 99-year land leases with Infrastructure Ontario to construct the rental units, retail and potential office space. Dream, Kilmer and Tricon hold equal ownership shares. In the second development, Canadian Real Estate Investment Trust (REF-UN-T) and Greenwin Inc. are partners on a 700-unit project. They are acquiring a 0.9-acre lot near the intersection of Yonge and College streets on a 50-50 basis. The Dream/Kilmer/Tricon lands are five development sites in the West Don Lands totalling nine acres, surrounding the intersection of Cherry and Mill Streets in the downtown east district. 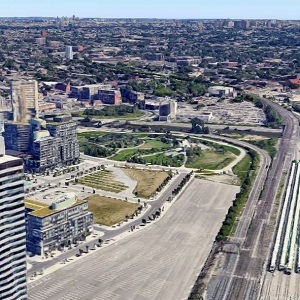 The lands are close to the Distillery District, Canary District and Waterfront Toronto’s Quayside, as well as Google‘s 13-acre-Sidewalk Labs proposed Sidewalk Toronto neighbourhood. The development is to be built in stages and include approximately 1,500 purpose-built residential units, up to 75,000 square feet of retail amenity space, and possible future office building. The first phase will feature approximately 750 rental units and 26,000 square feet of retail which is zoned and approved by the City of Toronto. The partnership hopes to begin construction during Q2 2019 with initial residential occupancy targeted for 2021. The project will be designed to achieve LEED Gold certification for sustainability. Dream and Kilmer previously partnered on the Pan Am Athletes’ Village and developed the Canary District in the West Don Lands, an award-winning mixed-use community of 1,800 condominiums and 60,000 square feet of retail. Dream has also co-developed the historic Distillery District since 2004. CREIT and Greenwin Inc. are partners on the second development, acquiring the 0.9-acre lot near Yonge and College streets on a 50-50 basis. The site is within walking distance to College TTC subway station, the University of Toronto, the hospital network and the downtown financial core. CREIT and Greenwin plan a two-tower, purpose-built rental development with approximately 700 units, 30 per cent of which will be affordable rental housing for a period of 40 years. The purchase is expected to close in early 2019. CREIT says due diligence conditions have been satisfied and the agreement is subject only to severance and other standard closing conditions. Dream has approximately $14 billion of assets under management in North America and Europe, including residential land and housing development, condominium and mixed-use development, asset management for four TSX-listed trusts, investments in and management of Canadian renewable energy infrastructure and commercial property ownership. Dream Alternatives offers investments in hard asset alternative investments, including real estate development. Kilmer Van Nostrand Co. Limited is the private investment holding company of Canadian business leader and philanthropist, Larry Tanenbaum O.C. Kilmer focuses on three verticals: 1) real estate and infrastructure 2) sports and entertainment, and 3) private capital investing. Over its 50-plus year history, Kilmer has actively built or helped to build a number of leading Canadian businesses in such areas as construction and building products, sports and media, cable operations, electronics assembly, textile manufacturing, publishing, food processing, charitable gaming and environmental rehabilitation. Tricon is a principal investor and asset manager focused on the residential real estate industry in North America with approximately $5.9 billion of assets under management. With 30 years of experience, Tricon has more than 19,000 single-family and multi-family units under management or in active development. Tricon owns or manages land and homebuilding assets, single-family rental homes, manufactured housing communities and purpose-built rental apartments. CREIT owns and manages a diversified portfolio of retail, industrial, office and residential properties. It is currently being acquired by Choice Properties REIT in a transaction valued at about $6 billion, including assets, debt and other liabilities. The transaction has received virtually all approvals and is scheduled to close on May 4. When completed, the acquisition will make Choice Properties Canada’s largest REIT. Greenwin is one of Canada’s largest privately owned, full-service property management and development firms. Headquartered in Toronto, Greenwin is engaged in multi-family housing, non-profit and affordable housing, social housing and commercial properties. Its portfolio includes more than 15,000 residential units and 1,000,000 square feet of commercial space.